Here we are with another Super Bowl between No. 1 seeds, with the Saints and Chiefs prevailing in their respective conference championship games today - excuse me. So that wasn't pass interference on Nickell Robey-Coleman? Then what is? 2) An upfront acceptance of the Occupational Privilege Tax, particularly if you'd prefer to keep your sanity in the midst of insane sequences of events. The officiating in both games, Sean McVay's decision to kick a field goal from the 1, Sean Payton's aggression on the Saints' final series of downs in regulation, Andy Reid's timeout management before halftime (and lack of timeout-calling in OT to literally let his defense breathe), and plenty more will be painstakingly dissected across the "Sports Mediaverse" in the coming days, if not weeks and beyond. Some of the analysis will have merit and much of it will be baseless. With it being our goal here to find value on the betting boards so that we can get edges in play, our time and energy is best spent focusing strictly on what we can take away from today that will help us get our Super Bowl portfolios into advantageous positions. To that end, I was decidedly unimpressed with the Rams' performance relative to what we see from most conference title game winners. Their opposition and the officials should both be much less forgiving in two weeks in Atlanta, and if there was concern about Todd Gurley's health coming into the day there's even more concern now. That had me anticipating an edge on the AFC champion, barring a blowout in Kansas City. While we certainly did not get the blowout it looked like it might become, I'm afraid we don't see the value I'd hoped for on the winner of the Lamar Hunt Trophy. After taking a quick, small bite of the Patriots at pick 'em, -1.5s and -2s are currently the norm at press time and that doesn't leave much meat on the bone at first glance. If we see a decent price, another way to get it on New England is taking them to score first - I have the Rams down as a team that tends to defer when winning the coin toss, and while the Patriots have also fit that mold historically, they did elect to receive last time they won the toss in the Divisional Round. It's a long shot to show up anywhere, but with New England calling the coin toss - the Patriots famously (perhaps a little too famously at this point) like to call heads - should a prop show up anywhere allowing us to wager on what the call will be on the coin toss, it's a near-automatic play with New England designated as the visiting team. And a favorite annual bet is no overtime, which might offer particularly low vig this time around with two conference championship OT games fresh in bettors' minds. Pinoy-T-X gave Matt Landes 2 Betpoint(s) for this post. Hec, if you don't see the message I left in the last thread, I don't have enough posts to respond to a private message. If you send me your email, I'll email you for the Slack group. I'll probably change my mind three times before the game,so take this with a grain of salt. But while I agree the current line doesn't leave much value based on the power ratings of the two teams, I really expect to see a Patriots win, and maybe an easy win. this thread has been so quiet this past week. Indeed - I expect things to pick up as the game approaches, and will have a prop-focused 2-Minute Drill later in the week. For now it has been a fair amount of waiting for some of my favorite annual props (no OT, no safety, no D/ST TD, yes one team to score 3 straight times) to come into the value range once enough recreational $ in seek of a big plus payout is in play. There’s nothing quite like the spectacle that is the Super Bowl, and lately it’s felt like the calm before the storm. Changing your mind is completely fine when there’s new (or at least newly acknowledged) information driving the change. We just want to be sure we’re working with the most comprehensive information we can be when it comes to putting our money in play. If more 3s become available offshore, that has me eyeing a Rams +3 to pair with Patriots pick ‘em in what would be a nice situation for such a potential seesaw affair. In the spirit of mind changes, my initial gut reaction after watching the games play out on championship weekend was that there is NO WAY BB/TB and the Patriots lose to a Jared Goff led team. BB will make Goff beat him, which he will not. Coaching advantage to the Patriots. Experience advantage, etc. As I gave myself a night or two to sleep on it, I came around fully to believing Rams will win outright and cover the number (+3, which is now generally available). As I have followed up with media/podcasts early this week/past weekend my opinion has only been strengthened. I am hearing many of the same points/arguments being made about this year's Rams team as last year's Eagles team and Nick Foles and realzied i initially fell into the trap, as well. Foles can't beat them. Experience. Bill and Tom etc. It seems like no one has learned anything. I would also add that in my opinion this Rams team is better than last year's Eagles team, while the Patriots are objectively a worse team. Furthermore, while I do agree Goff has his issues/limitations, you can not evaluate him in a vacuum. It is Goff + Mcvay. They will face less noise / pressure in a "wine and cheese" Superbowl crowd than they did in the Superdome and now have that experience to lean on. They also get to play the "no one believes in us card". How different would the narrative be if Malcolm Butler didn't intercept a crazy decision to pass at the goal line and Atlanta didn't completely implode. Bill and Tom off THREE STRAIGHT! Superbowl losses. Wow. I'm invested in Rams ML (likely to see value fall as kickoff approaches), points (sprinkled at 2.5, full go at 3), and 6-point open-ended teasers. You bring up some strong points, particularly around how different the narrative would be had 1-2 plays gone differently and New England comes in with a recent track record of Super Bowl losses. And with the impact public $ has on Super Bowl lines, the Patriots would likely be lesser favorites. So there seems to be some value on the Rams in this sense, particularly because it's not just Goff but Goff + McVay, as you said. But at its best the offense is Goff + McVay + Gurley + Kupp, among other key pieces, and no Kupp plus a limited Gurley means tougher sledding in the short passing game for a QB who doesn't work best with 5- and 7-step drops. Still hoping to see Rams +3 offshore as this one is feeling like a true toss-up. Gurley +15.5 yards vs Michel - contrarian it seems...and put me in the minority that think Gurley might come up big in this game. Pats o5.5 3rd down conversions (-120) - Matty Holt's best bet on dream preview. Makes sense to me. I'm aware a few of these have negative EV long term expectations, but hey, its the Super Bowl and I'll take small bets on bigger paydays. Looks like you have a few advantageous positions in the portfolio to go along with some bets to add to the entertainment value if nothing else. I'm with you on Goff and Cooks, and having gotten in early on White is feeling good right now so we'll see how it plays out. We're at opposite ends of the spectrum with regard to Gurley, but disagreements make it a fascinating marketplace. Before we dive into the final 2-Minute Drill of the season, I'd like to thank the Point Blank Community. We suffered an immeasurable loss last April and Dave's shoes are impossible to fill in ways that vastly transcend sports betting. But I think he'd be proud of the way we've rallied as a community - not only for the football edges shared here over the past five or so months, but for the dignity with which it's been done. While there's been some healthy handicapping disagreement over the course of the season, there hasn't been one out-of-line comment along the way. For an online forum in this day and age, that's an ultimate testament to the character of our community. As a programming note, I don't have much in the way of an offesason plan as betting outside of football is outside of my wheelhouse. So I think I'll kick off a football offseason thread early next week to carry us through to the kickoff of the 2019 season. Any edges in any sports and any walks of life will be welcome. If anyone has any feedback, I'm all ears. For now, let's focus on the task at hand and see if we can't finishing strong with a winning Super Sunday. As you might guess based on the above, Super Sunday is an annual favorite for my portfolio to see more vig than any other day of the year. Laying all that vig isn't for the faint of heart and losses can be costly, but the bottom line is that they tend to win more often than the odds imply they should. With the long-term bankroll in mind, that makes them a "go" - at the right prices, of course. I make a fair no-vig "No Overtime" line -1200, with a buy price of -900. "No Safety" should be in the range of -1600 - perhaps a touch lower if the uniqueness of the Super Bowl and the nerves that come with the brightest of lights gets factored in - with a buy price of -1000. "No D/ST TD" belongs in the ballpark of -300, with a buy price of -200. And "Yes" to a team scoring three straight times (excluding PATs/2-point conversions) should be around -200, with a buy price of -175. The best of these numbers is largely yet to come, likely arriving Saturday night/Sunday morning. For now we wait, ready to strike, as public money rolls in in search of seemingly favorable payouts with little upfront risk. The theme of laying the vig continues here, with lay prices of roughly -115, -150, -135 required to get in play on these three respective bets. But as with the Super Bowl staples, I find value at these numbers relative to what I consider the true probability. Starting with Cooks, I expect New England to bracket him and jam him at the line of scrimmage as the Patriots often do against the opposing team's biggest WR threat. Bill Belichick implemented a simlar game plan against Tyreek Hill, and while Hill did reel in a 42-yard reception it was his only catch of the game on just thee targets. Cooks can be considered a poor man's Hill, and perhaps an impoverished man's Hill when factoring in Belichick's familiarity with Cooks having coached him last season. Anticipating this scheme, Sean McVay could put Cooks in motion and look to get him the ball underneath in space. Keeping this and Cooks's big-play ability in mind, I've made it a split ticket on yards and receptions. Less Cooks would seem to correlate with more Woods. With no Cooper Kupp and what I consider to be a severely limited Todd Gurley (more on him later), the Rams are shorthanded in the short passing game. The Patriots may hone in on Cooks but they can't lock down everyone, and that should make Woods the beneficiary of increased opportunity. If you missed the boat on the first half under and the second half to outscore the first half, this is your chance to get in play at the same concept. This particular prop requires some shopping, but it is out there - I'm currently seeing it offered at -115. Chances are slim that this one will cash but for a slew of factors, I don't think they're as slim as the current odds imply. I'm seeing as high as 125:1, with 80:1 to 100:1 widely available. Let's call the buy price 80:1. The dome over Mercedes-Benz Stadium ensures pristine kicking conditions. With Goff less at the forefront of the Rams' offensive production than most Super Bowl-caliber QBs, there's a fair chance a non-QB claims MVP honors should the Rams prevail. Gurley would be a natural alternative at full strength, but I don't think we'll see that in this contest. That leaves the door slightly more open to a wild card winning the award. For all the offensive accolades he's earned, McVay's decision to kick a field goal from inside the 1 in the NFC Championship Game could predispose Zeurlein for a shot or two to rack up points from chip-shot range rather than someone else scoring a short TD. While this would require a lot to fall into place, it's not out of the realm of possibility - after all, we just saw the path to Zeurlein being an MVP in the Rams' most recent game. As a quick disclaimer, I didn't intend to make this a Rams-centric post. New England props are also a key part of the portfolio, with James White overs a full "go" at the openers between receptions and receiving yards, but the value on my favorite Patriots props is largely gone so there's no need to dig into them now. As with the aforementioned New England props, the best of Gurley rushing yards under is long gone with an opener north of 70 now hovering in the low- to mid-60s. That presents a middle opportunity for those of us who cleaned out the opener, but otherwise the current price is a no-go. The current odds on under 3.5 receptions, however, leave the window open to get in play against Gurley. I'm seeing as low as -120 out there and make it good up to -130. To be clear, my enthusiasm for this wager is a reflection not of his talent, but rather of his health. As mentioned in the rationale for the Conference Championship round's best bet on Gurley rushing yards under, there's no question he's miles better than C.J. Anderson. So I think the Rams are leaning more heavily on Anderson of late out of necessity, not out of a priority for his skill set over Gurley's. Gurley hasn't surpassed three targets in either playoff game thus far. Going from 18 touches in the Divisional Round to 5 against the Saints is an ominous sign for the state of his left knee. This number is shaded down slightly from Gurley's full regular-season average of roughly 4.25 receptions per game, but he's only hit that average once since Week 9 - three months ago in the Rams' first visit to the Superdome - and that was in Week 14 against Philadelphia, a Sunday Night affair in which his knee injury flared up. We haven't seen the same dominant Gurley since then. I'll be more suprised if we see an uninhibited Gurley this Sunday than if he's undergoing surgery to repair his knee shortly after the Super Bowl. IPAs have had their fair share of love here this season (if it's possible to show the IPA style its "fair share of love"), and Monkish has already been featured as well, so I wanted to branch out for this special occasion. I even went to what is now my new favorite beer festival last weekend in San Diego and tasted plenty of world-class candidates. But at the end of the day, I simply couldn't resist this opportunity - Monkish released the latest batch of Foggier Window the weekend of the conference championship games and moments before Rams kicked off in New Orleans, this was my view. Not a bad way to exhale after a bike ride up the hill to Dodger Stadium. It doesn't get much more "L.A. beer" than this, making it an all-too-appropriate selection for a Rams Super Bowl appearance. 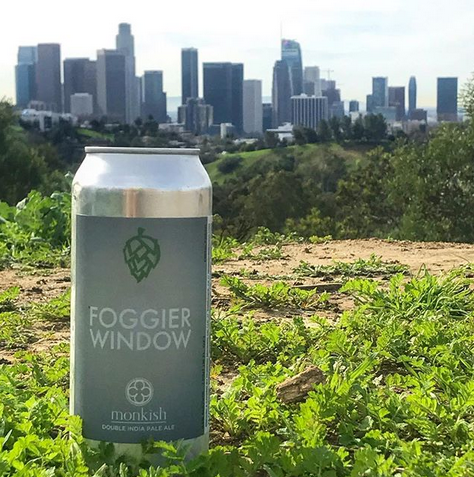 Foggier Window pours a hazy yellow orange with a bright white head and is bursting with notes of grapefruit and tropical fruit, with a light floral touch adding some depth. Its full body and soft, creamy mouthfeel make it irresitably easy to drink. Doing so is more than enjoyable enough to make the cut for a Super Sunday beer list, with a couple of extra "victory cans" on hand should the local team prevail. I decided to run the rams offensive numbers since Cooper Kupp went down and they're quite shocking. The adjusted offensive numbers say the team went from 7.8 YPA to 6.3, a stunning drop. The rush offense though has been better, although that could be really skewed by the cowboys game (remember its only 7 games without Kupp vs 11 with him). Anyway, does Cooper Kupp matter THAT much? I think it coincides with the injury to their great pass catching RB and that's why the drop looks so drastic. we think McDaniels will run the ball a lot more than the kid and contrary to popular theory, running is much more correlated to winning. therefore we want to consider props that benefit the idea of pats running/rams passing more. That means UNDER plays on the pats pass catchers and under plays on the rams runners. We also want to profit on the mistakes by Jared Goff. I really enjoyed the first half of the game, but after so many of our bets were good by halftime, I wanted to see some scoring in the second half...and it never came. Also wanted some scoring because I had the 0-0 square and after the first quarter I needed some TDs to get to 10 and 20.
right there with you. i put a large chunk of my 1h under winnings on the Pats TT 2h over and if the rams hadn't turned it over in the redzone, it probably would've come through. The Zeurlein miss at the end of the game was a nice kick in the groin... while I had Pats ML, my largest exposure in the game wound up being the Rams +8.5. In the spirit of moving forward and with about 7 months to go until the next kickoff that counts, here is a new thread to hold us over for all to come during football's offseason. Football Season not over yet. Reminds me of the XFL days always bet on the unders. this weekend 3 out of 4 games went under. I’ve had a good start to the AAF as well. Went 3-1 opening weekend with two 2h Saturday unders and two unders on Sunday. only have SA +6 in pocket for today. The model leans over on the Orlando game, 39.5 may be too low. Whoever took unders since the start of the season are 10-2.
i don’t even watch this crap, it reminds me of the XFL in a way, just keep taking the unders until the books adjust the line in a few weeks. Have the totals been dropping each week? I haven't paid very close attention, but I'd imagine that they've adjusted by now. Yes,week one started in the 50’s , now it’s on the midd 40’s, so they are adjusting. Like I said earlier it reminds me of the XFL years when they started capping on the Upper 40’s then by mid season totals where capped at upper 30’s. my AAF model went 3-0 last week and is now 6-2 on the season. 33.5 in a game involving Orlando was a gift. Thanks for the 3rd quarter winner bookies!! I guess with March Madness running down, it's time to start watching football again! AAF was fun while it lasted, they’re about to suspend the league on what I’ve heard. Won 6 out of 8 weeks. Damn I miss David’s insight on MLB , just seems like yesterday that he was sharing his brain with us. Anybody continuing the professors legacy on MLB like Matt did for NFL? That so many of us continue to miss Dave every day speaks volumes of his timeless impact. I don’t think we have a regular MLB forum, but this thread would be a fit for any and all edges as football’s offseason progresses. One year ago today, we lost a legend. In a way it seems fitting, then, to have just witnessed a living legend in his own right return to glory at Augusta. Through the ups and downs and everything in between, there's something timeless about true greatness. I'd like to think Dave would approve of cueing up this selection from the jukebox in his honor.